I'm looking for a cost effective FB ads contractor with experience in running retargeting ads to manage my client's ads. Bonus points if you have dealt with a Restaurant client. 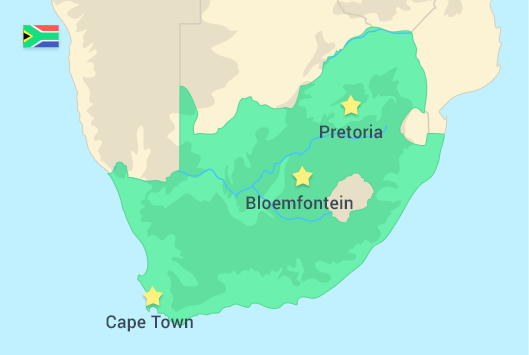 South Africa is situated in the southernmost part of the African continent. It has a territory of 471,445 square miles and is home to more than 55 million people. Its borders include 1,739 miles of coastline on the Atlantic and Indian Oceans. Known for its breathtaking natural attractions, South Africa is a popular tourist destination that offers stunning views and diverse wildlife. The country has a rich history of multiethnicity, but still struggles with the painful effects of Apartheid. It was colonized by the Dutch and has been occupied by the British, so various cultural influences are present. Most South Africans have Sub-Saharan roots. Another significant percentage of citizens are of European and Indian origin. South Africa is the second largest economy on the continent, and is rated as upper-middle-income. It has a high GDP in comparison with the rest of African countries. The economy is rated as mixed, and there is a functioning welfare system. Its major export products include fruits, corn, sugar, diamonds, gold, and other metals. More than 65% of South Africans live in urban areas. Soweto has the largest population with almost 1.3 million inhabitants. Johannesburg is the second biggest city with almost a million, followed by Pretoria with about 800,000 citizens. Durban, Tembisa, Cape Town, Katlehong, and Umlazi have between 400,000 and 500,000 people each. With unstable employment growth and changing economic circumstances, many young South Africans choose freelancing as an alternative work path. It enables them to reach larger markets and offer high-quality services to a larger potential group of clients. The largest portion of remote workers in the country are in the fields of IT and creative. There are 11 official languages in South Africa. Afrikaans and English are two of the most significant, and the nine others originate from different African ethnic groups. English is the language of choice for business, sciences and education. The literacy rate in the country is 94.3%. Education in South Africa is three-tiered, with university education as the third step. There are 23 public universities divided into three categories. They are traditional institutions; technological universities, or Technikons, that offer vocational studies; and comprehensive options, which offer a mixture of the two approaches. The top educational institutions in the country are the University of Cape Town, University of the Witwatersrand, Stellenbosch University, and University of Pretoria. They offer high-quality programs in sciences, law, agriculture, architecture, development studies, and technologies. The average monthly income in South Africa was 18,100 ZAR (about $1,300) at the end of 2016. Low-skilled jobs pay about 4,000 ZAR per month ($300). High-skilled work can pay more than 20,000 ZAR ($1,450). Salaries in the cities are higher, so freelancers from urban areas will usually demand a higher payment rate. The currency in South Africa is the South African rand (ZAR). The exchange rate is 1 USD to 13.86 ZAR. Most well-known international payment services, such as PayPal, Payoneer, and Transferwise operate in South Africa.